You might think that if you’ve seen one haunted house, you’ve seen them all—but that’s not entirely true. Though there are common themes, no two haunts are exactly the same. Each has its own distinct vision of providing a good, old-fashioned scare. The Castle of Chaos is entering its final year at the 3300 South location, and they’re making sure to go out with a bang. This location focuses on a figure called “The Collector” who, throughout the many different staging areas, more than lives up to the title. The basics are all there—a meat-packing plant, morgue and toy factory with creatures lurking in the shadows. “Castle” is one of the darkest haunts—literally. Most everything is painted black, with very little light coming in, forcing you to feel your way through large sections. With the “Hands On” experience (which requires being over 18 and signing a waiver), you get a glow-in-the-dark wristband and become an open target to be picked up, separated from your group and dropped off in the middle of nowhere—all alone. The “Trilogy of Terror” ticket gives you access to all three locations, which can be used all on the same day or spread out to let your heart rate recover. A new addition to Utah’s growing list of haunted houses is a breath of fresh air. While most haunts are confined to an indoor warehouse, Strangling Brothers is different. Sitting on a patch of land off I-15, the giant circus tent and carnival rides look normal, but the haunt itself is a refreshing mixture of both indoor and outdoor areas, moving in and out of a maze of more than 20 semi-trailers. The traveling-carnival/circus theme is the most prevalent, but each trailer is designed for a different look and doesn’t always subscribe to the “darker is better” rule. While many are dark—some very dark—there are a few brightly lit sets that still manage to elicit a good scare using other creative tactics. The animatronics are top-notch, and there are more than a few pieces that would be rude to spoil. Once you’ve survived the circus—if you haven’t quit halfway through, like some—Strangling Brothers offers full concessions, rides and carnival games to keep you entertained well into the night. While the old-guard haunted houses remain, they’ll have to keep looking over their shoulder at a new crop of attractions popping up. 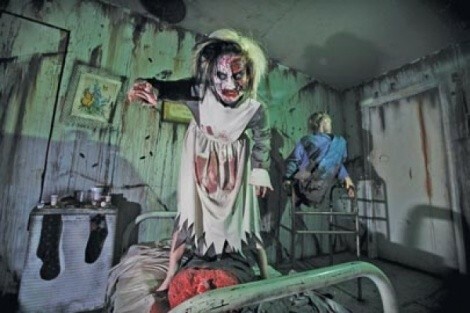 Fear Factory has taken a decrepit, abandoned cement factory and turned it into one of the most exciting new haunts. The building was already creepy, and Fear Factory has captured that essence—as well as added to it—by utilizing every available area of almost an entire city block in a run-down industrial zone. Fear Factory is also able to move visitors inside and outside, making sure they never get too used to one area; one of its greatest strengths is being able to take advantage of just how tall certain parts of the building are. Be warned, though: If heights aren’t your thing, you might want to consider staying outside in the safety of lurkers from the graveyard—who might just be some of the building’s former employees.